The Alaska Chapter was fortunate to be able to send three members to the National Conference in Quebec City in July. Lt. Brian Wassmann, Alaska State Troopers (AST) was selected as our member for this year to attend the conference. The Chapter was also able to send Vice Presidents Captain Barry Wilson and Lt. Chad Goeden both from AST. Lt. Wassmann said he appreciated the support from the Alaska Chapter to attend the conference. He related that he had a wonderful time catching up with classmates and meeting quite a few other graduates. He and his wife spent quite a bit of time walking around the area and they enjoyed the European feel to the Canadian city. Lt. Wassmann said he had the opportunity to attend many informative sessions. One in particular on social media piqued his interest. He said it was very interesting to see how many agencies are using twitter feeds to update the public on law enforcement issues, request information and respond to emergent issues trending on social media. Police can get ahead of negative information and direct narratives toward more accuracy. Captain Wilson is the training chair for the Alaska Chapter. He reported having the chance to meet people he had recently spoken with on the phone and over email regarding the Comprehensive Officer Resiliency Program, and other training possibilities for Alaska. He said the conference was well worth his time to attend. The Quebec City did an excellent job with impressive attendance. Lt. Goeden said the conference was a great way for him to see old classmates, reconnect with other FBINAA members from around Alaska, and visit beautiful Quebec City. Lt. Goeden is the commander for the Department of Public Safety Training Academy and as a result of meeting with some of the vendors he has purchased new fitness analysis equipment, and he is looking at purchasing other training equipment as well. Lt. Goeden said that as the membership committee chair, it was also helpful to meet with the membership folks at the national level and appreciates being able to a face with a name. Lt. Chad Goeden (Session #266) and his wife, Kelly. Both were appreciative of the opportunity to attend the National Conference and visit beautiful Quebec City. 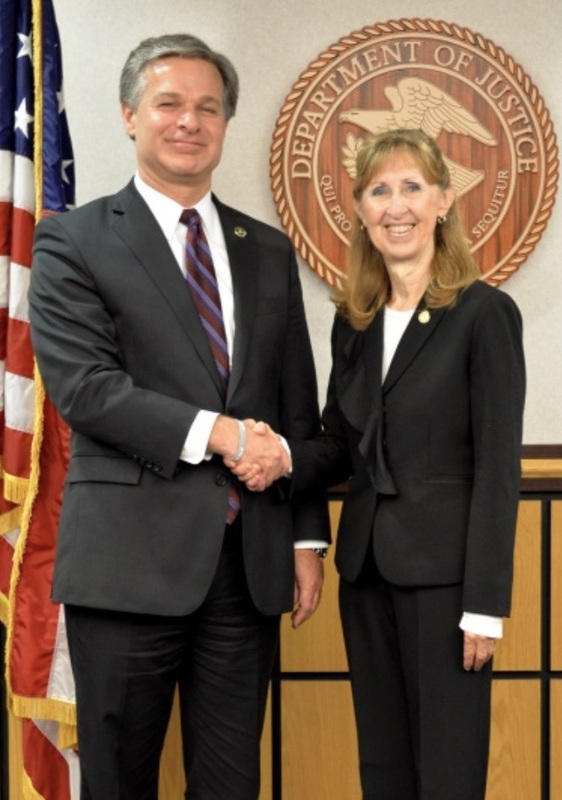 On August 7, 2018 FBI Director Christopher Wray visited Alaska. He met with many top level administrators and law enforcement officials to talk about the FBI and the efforts to combat crime with their many partners. He said he was impressed by how closely the federal, state and local law enforcement agencies work together in Alaska. It is something of which we are very proud. Director Wray and President of the Alaska Chapter, Shirley Coté (Session #164. Shirley giving Director Wray pieces of Alaskan art – a billiken, Alaska’s good luck charm, and a soapstone, caribou bone and pheasant feathered wedding dancer. On August 8, 2018 the Anchorage field office of the FBI threw a going away party for SAC Marlin Ritzman and his wife, Juliette who also worked in the office. Mr. Ritzman was promoted to the records section and they are moving back east. Mr. Ritzman was an active member of the Alaska Chapter. He participated in all our general membership meetings, many of our executive board meetings, and all our functions. His support was phenomenal. President Shirley Coté presented Mr. Ritzman with an engraved Alaska goldpan. He will be truly missed and we wish him great luck in his new position. Mr. Ritzman and just a few of the friends he made in his two short years in Alaska. The Training Committee, led by Captain Barry Wilson has begun their work in organizing their annual re-training. The Executive Development Conference will be held December 5-7, 2018 in Anchorage. We welcome anyone who wishes to attend, understanding we have a capacity of 100 seats. Registration will begin in October.